In December, 2003 the Zetas declared that the Earth had been stopped in its orbit, finding the monster Planet X, aka Nibiru, in its path. The Zetas had hinted that this would occur, earlier in the year. The Zetas refer to their dissertations on orbits, the rotation of planets and the factors affecting rotation, the flow of gravity particles and the Repulsion Force preventing collisions, how magnetic particles operate, how the Sun has Sweeping Arms that cause the planets to orbit round its middle, and how many particles go in and out of the Sun at the Ecliptic. 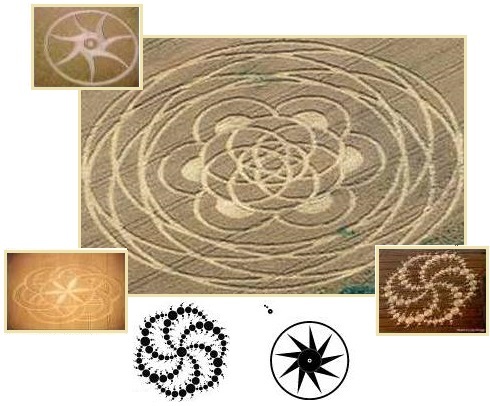 Crop circle designs showing orbit lock relate. ZetaTalk Explanation 8/20/2003: Orbits are not sacred, can be stopped, can be reversed, can be altered such that a planet veers closer to its Sun or outward in a more elliptical manner, can dip down or raise such that the orbit takes a different path, and then return or not return, depending. Thus, the current Earth orbit should not be considered written in stone, immutable, and any change is possible. Life on a planet does not end if an orbit changes, and often scarcely notices. The days may be cooler or warmer, the stars in a different place, and the seasons and sunset and sunrise times radically different, but overall, unless an orbit change puts a planet into the Sun such that life fries, or into cold space such that it freezes, it is not a death sentence. In the battle about to ensue between Earth and Planet X, the larger will get a grip on the lesser and not let go until havoc has been unleashed on Earth. Why would Earth’s orbit, in this drama, be exempt from such a grip? What would stop the orbit of Earth from reversing, stopping, or drawing closer to Planet X? This is a radical concept for most of mankind, engendering disbelief. To reduce immediate anxiety among mankind, benign aliens continued to tip the globe back and forth, simulating the seasons, and assuring that celebrations of the Solstice occurred as expected. Was there any proof that a stopped orbit had happened? The stopped orbit occurred without warning for the establishment. They were caught by surprise. An example is how comets C/2001 Q4 and C/2002 T7 came early, and arrived on the wrong trajectory. How did this happen except by a stopped orbit, so the Earth encountered these comets before their time? ZetaTalk Insight 2/19/2004: How does the common man, given this confusing situation, sort out the truth of the matter? Fortunately, we have comets! 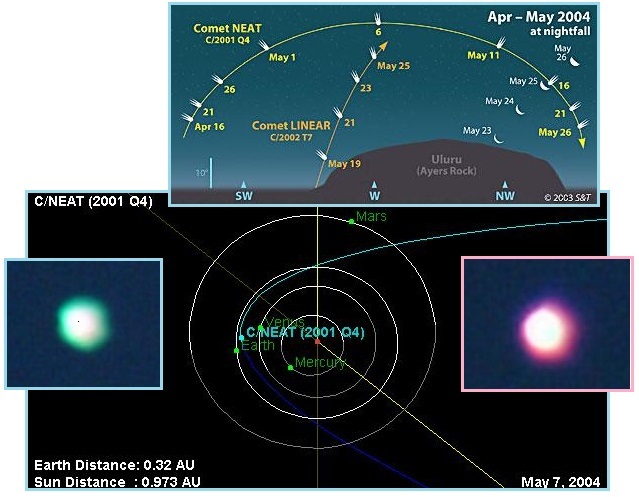 When discovered, their orbits ascertained and computed, comets C/2001 Q4 and C/2002 T7 were declared to arrive at perihelion in May, 2004, and certainly not visible naked eye prior to that time, if ever! So what is it the common man is seeing, in droves, in the sky just after sunset! It moved, has a tail, and is in their face astonishing them! Comets come early, because the orbit of Earth has backed into them. Comets orbit the Sun in the same counterclockwise motion that the planets assume in their orbits. Thus, the May perihelion dates assumed an Earth running ahead of the comets, the comets needing this time to catch up to the Earth in her orbit. Earth stopped, reversed, and the dates have arrived early! The fact that the constellations appeared out of place, and a Second Sun would be seen at dawn and dusk on occasion were ignored by NASA. 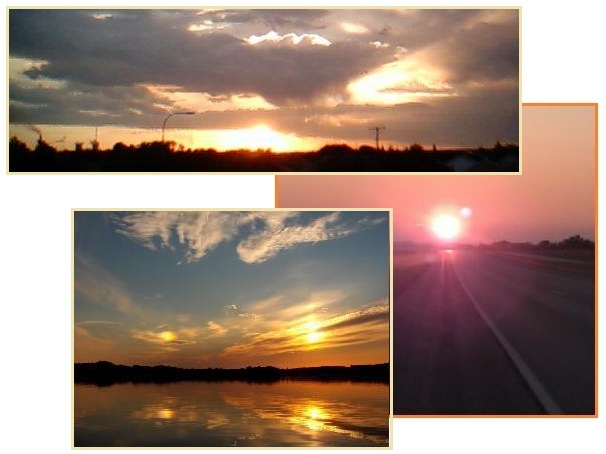 Images from NASA satellites such as SOHO and Stereo were doctored to eliminate evidence of Nibiru, with a backdrop of stars and passing planets inserted. The Sun and its flares remained true, but almost everything else was a NASA movie, as the Zetas explained. ZetaTalk Comment 4/28/2010: We have mentioned that we simulate reality while the cover-up over Planet X is firmly in place, so that the establishment does not panic in anticipation of rioting by the citizenry. The Council of Worlds allows enough to be obvious to the common man so that those who are courageous enough to face the future and plan for their safety and the safety of their loved ones can do so. Those who would make demands on their governments, or panic, are thus allowed to continue to lull themselves with denial. Thus a duality exists in what mankind perceives. On the one hand the Earth wobble is evident, the Sun rising and setting where it ought not, the Moon well out of position, the weather and tides extreme, the uptick in earthquakes and volcanism obvious, and Second Sun and Moon Swirl sightings increasingly captured on video. On the other hand, official sites such as the SOHO and Stereo sites pronounce all is normal and provide regular images that seemingly prove this point. But the Council of Worlds is allowing a steady slip of the cover to reveal the truth about the presence of Planet X in the inner solar system. Struggling to maintain the cover-up over the presence of Nibiru, aka Planet X, NASA has continued to show the Earth in its normal orbit in Stereo diagrams, whereas per the Zetas the Earth has been pushed back into the August position, and there it will remain until the passage of Nibiru is complete. The actual positions of the Earth vs a vs the Stereo satellites is not what NASA presents, per the Zetas. Thus, NASA will be taking the Stereo cams offline soon, to avoid having to explain. ZetaTalk Explanation 7/5/2014: A second concern is the halted Earth orbit. This fact is considered so radical that NASA and others have determined that admitting it would confuse the public, and make them think the whole announcement admitting the presence of Nibiru is a hoax, a game. Thus, beyond stating that the Earth’s orbit and rotation have “irregularities”, such as the Earth wobble, they will not admit a halted orbit. But Stereo cams that are supposed to be looking directly at the Earth will soon show this to be the case. The Earth will be missing. To avoid closer scrutiny, expected to occur after the announcement, they are simply taking public access to Stereo images offline, and they will never come back on. But before the Stereo cams could go offline, a dramatic proof of the halted orbit was handed to mankind! A sharp observer posted this proof on the Pole Shift ning blog dedicated to SOHO and Stereo images. 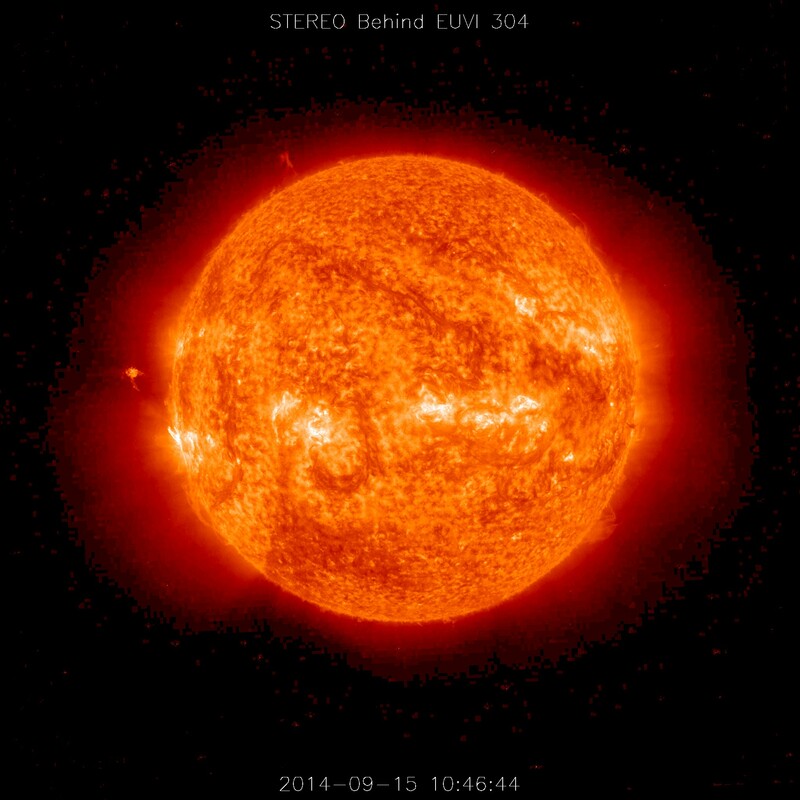 The Stereo Behind image for September 15, 2014 showed a solar flare clearly on the left of Sun. If the SOHO SDO satellites were positioned where claimed by NASA, in the mid-September position, it would also be clearly visible on the right. But it is seen as flitting out from behind the Sun briefly, showing that the SOHO SDO satellite is in fact in the August position. Proof that the Earth is in the August position. The solar flare in question was on 9/15/14 at 10:46. It was caught by STEREO behind EUVI 304 and SDO AIA 304. STEREO behind only has one image of it. SDO is able to go down to one second between images. The two are separate satellites. SDO orbits earth. 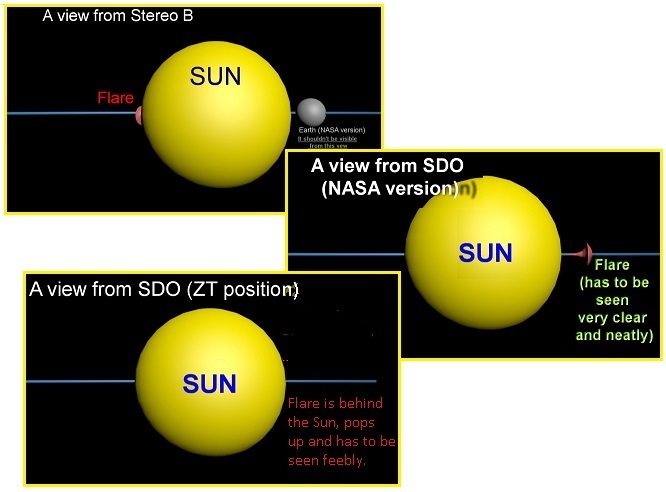 STEREO has a much larger orbit and orbits the Sun. The STEREO behind EUVI 304 image for 9/15/14 can be found here. That flare is seen at the 9 o'clock position from STEREO behind. Taking the same date and time. 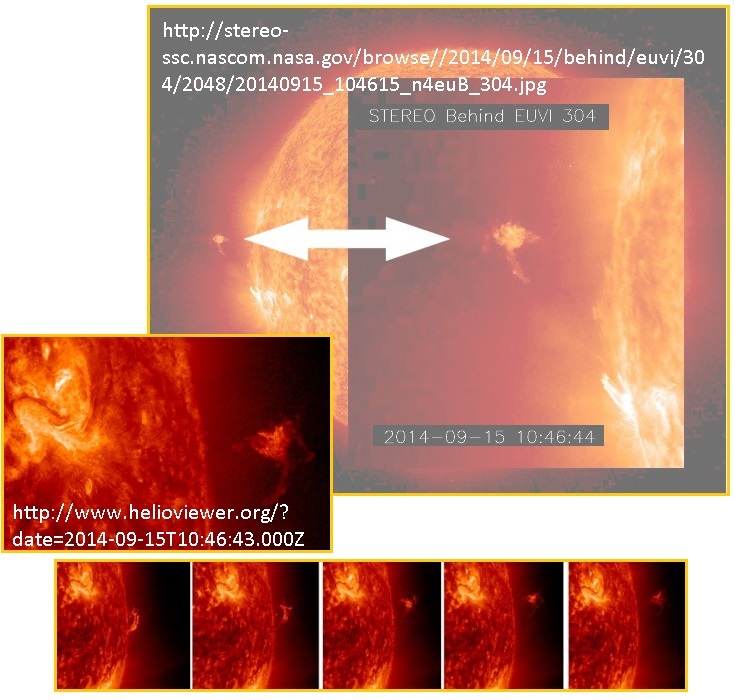 Look at the SDO helioviewer page at the same date and time. That same flare can be seen at the 3 o'clock with SDO. Step the image time step back/forward from the 10:46 time by 1 minute and you can see it pop up. I did a quick image of where approximately that flare was: That flare happened right about where the white star on my image and just over where it says "Sun". Via SDO you can see it forms and pops up very close to the surface of the Sun. You don't see much via STEREO images just the formed flare but you can see it. 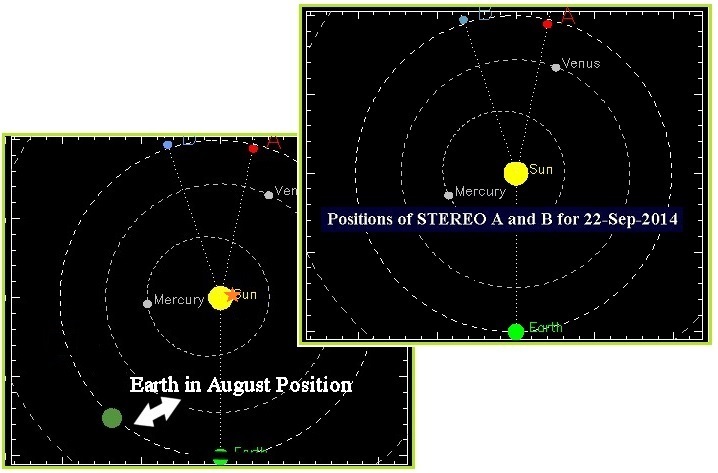 STEREO is where NASA says they are on the map but lie about the location of Earth. With the corrected position of Earth via the Zeta's you can see that the flare while not in 3D. It was caught at two separate angles and you can correlate an approximate 3D location. If you look where the field of view is for STEREO B and where the flare is in the STEREO image. Then look at SDO image and where the flare is while also remembering SDO orbits Earth. Giving SDO essentially an Earth view point of the Sun. Then you have proof that Earth is where the Zeta's say we are. In the August position. I'd assume this could be done with just about any flare caught by both STEREO and SDO. That one just happens to be such an odd shape so you know for sure it's the same one. The referendum whereby Scotland voted to either stay in a union with the UK or become a separate country took place on September 18, 2014. Though a week before the vote the polls showed the YES vote for independence creeping up to 51%, the actual vote count showed a 10% lead for NO. The move to independence was very threatening to the UK and the EU, for many reasons, as Scotland has wealth in North Sea oil wells. In addition, it is highlands, and will remain above the waves after the Pole Shift and rise in sea level. The Queen went horseback riding on her Scotland estate. Cameron toured and begged. Was election rigging involved? Per the Zetas, this would not be the first time. This will be like Bush stealing the election in the USA and it will linger causing tremendous resentment in Britain. The whole of Europe needed the Scottish NO vote. Since Brussels rigged the Italian elections, we cannot rule out their involvement behind the scenes yet in Scotland. This has led to so many in Scotland feeling they have been cheated and reduced to second class slaves of London and Brussels. The EU Commission was threatened by Scotland because if they won their independence, the contagion would have engulfed all of Europe and that would cost jobs in Brussels. This is not about what is good for Europe, it is what is now good for the politicians to keep their huge salaries. Speaking after the Sunday morning service at Crathie Kirk near her Balmoral estate in Scotland, the Queen told a well-wisher: "Well, I hope people will think very carefully about the future." ZetaTalk Observation 9/27/2014: Election fraud is certainly nothing new, so widespread as to be universal. During the famous election rigging in the 2000 and 2004 Presidential elections, during which George W. Bush resoundingly lost to his opponents but was installed in the White House anyway, the following tricks were used. There was no way to support a recount as Diebold machines electronically captured the votes, and electronic results could be changed with no audit trail. Counts were easily changed by wifi laptops nearby, and were observed being changed. Ballots on paper were lost, at times found in dumpsters. And recounts were denied by Republican judges and state officials. But when the votes came in, talk of fraud and election rigging began. Per the Zetas, the vote was indeed stolen from the YES folks. The most obvious clue per the Zetas was the swing in momentum, the change in direction, which can be controlled by carefully selecting which groups are polled. Even with this possibility, the polls showed the election squeaky close the day before voting began. A YouGov survey for The Sun and The Times and a separate poll by Panelbase both found 52% of Scots will to vote to stay in the union, with 48% favouring independence, when undecided voters are excluded. But research by Ipsos-Mori for the broadcaster STV suggested the gap could be even closer, indicating 51% of people will vote No to 49% saying Yes. The final opinion polls before the vote suggested that the campaign against independence retained a very slight lead. But with significant numbers of people still undecided, the result will remain impossible to predict until the early hours of Friday morning. An Ipsos-MORI poll tonight suggested that Scotland would reject independence by the smallest of margins, with 51 per cent of people intending to vote No and 49 per cent Yes, excluding undecided voters. A separate Panelbase survey had very similar findings, with 52 per cent saying they favoured keeping the union and 48 per cent keen to go it alone. Both polls suggested that about five per cent of voters – or one in 20 – remain undecided and could swing the result. 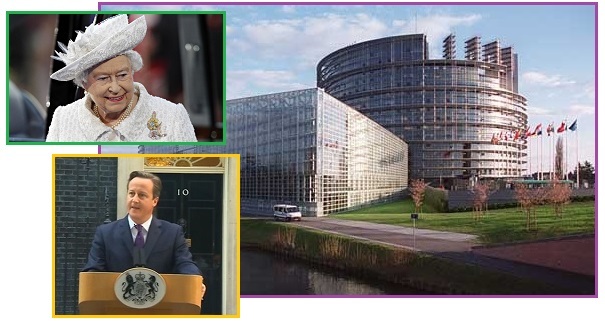 ZetaTalk Observation 9/27/2014: The clues that the vote in Scotland was rigged are many. The polls were on an upswing for the YES vote, and then suddenly turned the other way, at least in the press. Momentum on a much debated subject does not suddenly swing. Momentum going into the final days traditionally continues to build, reflecting undecided voters finally making a choice. What would have changed the direction? New facts? Polls are manipulated in several ways, by carefully choosing the respondents to skew the result, and by limiting the number of respondents. It is important to have the polls going into an election mirror the results. In Scotland, even the final polls only showed a 2% advantage to NO, vs a final result of almost 10%. Then there were the complaints that election observers were not frankly allowed to observe. They were kept on the perimeter of a huge room. They noted YES votes assigned to NO vote piles. There were a few complaints that voters found their name had already been used. But per the Zetas, this is not where the crux of the fraud lay. Paper ballots can be recounted, and likely were recounted. The fraud took another route. There are tables, with voting papers stacked upon them, but the observers are stuck around the perimeter. Even if you want to, it's impossible to tell what's happening. It's also unclear where the boxes with ballot papers come from. Police in Glasgow are investigating ten cases of suspected electoral fraud. Voters turned up at polling stations to find that people had already voted using their names. Glasgow City Council confirmed that there had been 10 instances where people had gone to vote and found their names had already been crossed off the list. Despite a ten per cent margin of victory for the ‘No’ campaign in the Scottish referendum, some supporters of the ‘Yes’ camp are pointing to videos which they claim show evidence of vote rigging. 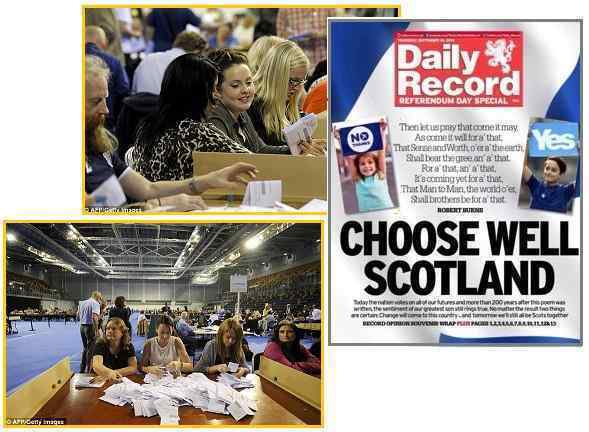 In the first example, bundles of referendum papers are seen on top of a table designated for ‘No’ votes and yet when zoomed in, the top paper on two of the bundles clearly shows an X marked in the box for ‘Yes’. Police in Glasgow are also investigating at least ten cases of vote fraud where people turned up to vote only to find that their names had already been crossed off the list, suggesting other people were voting multiple times. Per the Zetas, the hand of fraud can be seen on the percentage differences. Where Scotland as a whole had an 85% turnout, voting in key districts where a strong YES vote in a heavily populated area was expected recorded almost 10% fewer votes. Dundee had 78.8% turnout and Edinburgh a mere 75%. There was also the suspicious fire alarm called twice in Dundee, so the ballots were not protected during the evacuation. No observers were assigned to accompany the ballots to the counting rooms. The ballots thus can be recounted endlessly, but the crux of the issue will not be exposed. Only matching each ballot with a voter will show that the YES vote was under represented, by fraud. Members of the media expressed skepticism at the "North Korean"-style turnout level — a dubiously high 90 percent. In Dundee, a fire alarm led to the evacuation of the building where the vote was being counted. In Dundee, a strong YES area, the count was suspended twice due to fire alarms. The turnout in the strong YES area of Dundee was 78.8%, which is lower than the 85% turnout in Scotland as a whole In Dundee, 'Yes' ballot papers were spotted on a 'No' table. Turnout, while high, was slightly below expectations, hovering around 80-85 percent for most areas. Notably, Edinburgh, the largest council area by population, clocked in at a mere 75 percent. ZetaTalk Observation 9/27/2014: Where the focus is on how the observers were kept away from the counting tables, and how ballots were placed in the wrong piles, this is looking in the wrong direction. Paper ballots can be recounted, and were recounted. Fraud thus happened before the ballots reached the counting rooms. An example is Dundee where fire alarms emptied the rooms and the vote turnout was a full 6% lower than the rest of Scotland. Edinburgh had a turnout a full 10% below the rest of Scotland. Was the weather a deterrent? Thus the will of Scotland was stolen, for the EU, for the Queen, and for the establishment in general. In the end, it will not matter, as the Pole Shift will be a great leveler.